Home » PSP 6.35 Pro-B5 LCFW released! More updates from Coldbird and Liquidzigong for 6.35 Pro LCFW. This release includes bugfixes and specific game fixes for DJMAX3. No need to install the previous releases to be able to install 6.35 Pro-B5. You do need to be on 6.35 OFW however. If you’re not on 6.35 OFW and want to install 6.35 Pro-B5, follow this guide: HowTo: Upgrade your PSP to 6.35 OFW. To install, just place the folders from the zip file into PSP/GAME and run 6.35 Pro-B5 from your XMB. Use the fast recovery to reload 6.35 Pro-B5 LCFW without doing the reinstall process again. I bought a PSP-3004 Radiant Red with 6.35 OFW. Last week I gave it to a local game store for hacking my PSP. Now I have a PSP with that can play games from memory card by first running “Everybody’s Sukkiri Demo” — pressing ‘O’ button — back to XMB and then running Promatheus Loader to select and run any iso/cso files I have stored in my ISO folder. Since i’m a beginner at this, I want to know WHAT, and more importantly HOW should I make my PSP play “Marvel Nemesis” and “POP Rival Swords” ??? OR 6.35 Pro-B aka this page right here! I know a long post but KINDLY HELP me !! And if its possible provide simple instructions to noobs like me! Just follow the instructions on that page (6.35 Pro-A) to install it on your PSP. To upgrade, just replace the files with the ones from this post. So I first need to “upgrade” to 6.35 Pro-A and then 6.35 Pro-B5 ?? Kinda confusing, ya know? Thus my first post was that long. Please reply! My bad, I guess I didn’t explain it thoroughly. Since you’re a newbie to the PSP world, follow the instructions on the 6.35 Pro-A page and use the files for 6.35 Pro-B5. Yep. They’re stand alone so you can just install the latest. hahah thanks to @saito for asking the same question in a far more better and precise way than me! @sylv3rblade – I’ll do just dat but sometime later and only then will respond how it went! Yep, you can install 6.35 Pro-B5 straight from 6.35 OFW. Got a problem here..After I updated my psp to 6.35 Pro-B, it suddenly shut down and when I opened it, it showed, ” Version 6.35″..Is that ok? Just 6.35? Not 6.35 Pro-B5? Ah, 6.35 Pro is different from this release as 6.35 Pro-B5 is the “better” version of 6.35 Pro. To install the Hen with the PSX emulator, turn off your PSP (to revert to OFW) and follow the instructions on this page. Did you install using the Updater? Or the Fast Recovery? I used the updater for the installation..:/…And as you see, everytime I do, it shuts down suddenly. This is odd. Try downloading the installer for 6.35 Pro-B4 (the earlier build) if it still doesn’t work, likely a file for the installation is missing. nah, i think 6.35 PRO-B5 is not stable yet, i have similar problem. Successfully getting to 6.35 Pro-B5, then ANY game I played, after around 10mins, BOOM! then power it on > instant BOOM! What game are you experiencing this with? Also what plugins do you have installed? Still won’t work…but when I uninstall the CFW, it reboots, not shutting down suddenly. what does fast recovery do? 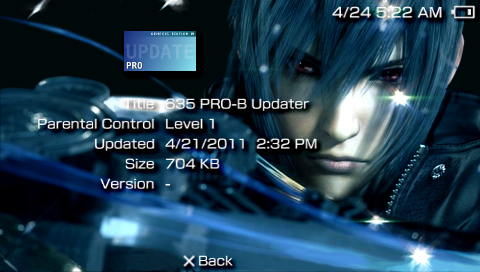 It allows you to restore 6.35 Pro-B5 if for some reason it gets unloaded from your PSP. Kuya how about if my psp is already 5.03 gen C full, can I still update this to 6.35 OFW? I really want to install this 6.35 CFW Pro-B5. Yes you can update to 6.35 OFW. Just make sure you unload 5.03 GEN-C (turn off your PSP) before upgrading. my psp version 6.31.is that possible to use 6.35 pro-B5 in my psp ? Hi, I was running 5.50-Gen-D3 and just updated my firmware to OFW 6.35. But when I try to put the 6.35 Pro-B5 (and other 6.35 Pro versions) in my PSP/GAME/UPDATE folder I get ‘corrupted data’ when I go on my psp to run the CFW. Am I doing something wrong? I have a PSP 1003.
pls i have a psp 3003 6.35 nd i don’t know if its chicken hackd but d problem how do i hack it so dat i can play games 4rm my memory card.i need ur help pls. i have psp 1000 does it work? saan mo nakuha psp theme mo?